In our final class discussion, we talked about special habitats that can help store carbon for the short term, helping in our struggle to deal with human carbon emissions. These special habitats - seagrass, kelp forests, and coastal seaweeds - rely on vegetation as their foundation species, which are ecologically, environmentally, and economically beneficial! These habitats provide an ideal environment for shellfish and coral reef growth. And, these vegetated habitats help to store the carbon dioxide from ocean water which helps in reducing the effects of climate change and increased ocean acidification in the short term. 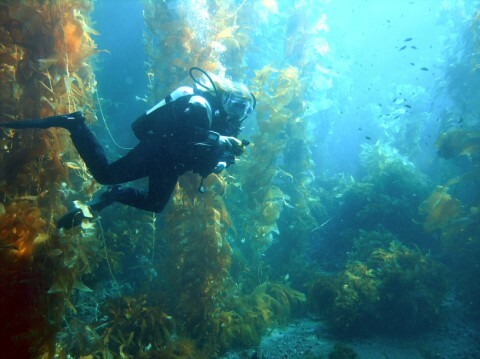 To top it all off, these habitats can also generate jobs for local or global economies (as evidenced by the market value of kelp farming estimated to be $5 billion to $5.6 billion) and they can be used as an alternative for natural gas as a form of bio-digested methane, so they are also economically beneficial for humans. Articles that we read for our discussion highlighted that researchers from different countries have studied the benefits of utilizing kelp and seagrass to help combat ocean acidification and climate change. Seaweed and seagrass are both utilized as a minor step towards decreasing the amount of carbon dioxide in the water. Using the seagrass or algae as a place to store carbon has limitations: they tend to grow in shallow water (a small fraction of the total ocean), and they are limited by light and nutrients since the process is based upon photosynthesis. As our class discussed the topic of carbon storage, many questions were raised about the natural cycles of carbon within Earth. Our professor, Tessa Hill, taught our class about the short-term cyclic movement of carbon. Professor Hill mentioned the four essential carbon storage areas: atmosphere, soils/biosphere, oceans, and deep within the Earth. Questions were also raised about the ethics and long-term consequences that come with utilizing these fossil fuels stored deep within the earth by humans as our increased carbon consumption would lead to increased greenhouse gases and global warming, and it would lead to increased ocean acidification as more carbon is stored in our oceans. To deal with the human disruption of the natural, cyclic, slow (millions of years!) movement of carbon, our class proposed of our need to decrease carbon dioxide emissions by reducing fossil fuel use and by shifting to green energy and fuels. We also agreed that utilizing and increasing the protection of seagrass, kelp, and seaweed habitats seemed like a wise move. Hopefully, this will ultimately help with carbon storage and alleviate the excess storage of carbon in our oceans. Similarly, our class liked the idea of protecting and preserving forests and other land biomes that also help with storing carbon in the short-run. As this was our last meeting of the quarter, we wrapped up the discussion with a conversation about how we plan on improving the health and safety of the ocean through our own actions. Some resolutions were smaller, such as bringing reusable cups and bottles to coffee shops, and leaning towards eating more sustainable seafood. Others were much larger, including working towards educating K-12 students about the effects we have on the ocean. While some resolutions may have a smaller impact than others, we agree that any action towards protecting our oceans is extremely beneficial and will ultimately help ocean health and biodiversity. For additional Ocean Optimism blog posts, check out our archives below!